Recipes come in many ways. Books, magazines, newspapers, blogs, word of mouth and family secrets passed down from generations. This recipe came to me written behind the packaging of a tart mould. A mould I had purchased during one of my trips abroad and was lying unused for almost 2 years. And there was this huge ripe pineapple that was waiting to be turned into jam and I thought that these biscuits were just the ticket to use up that jam. When I read the recipe it reminded me of the custard tarts that my aunt Rekha’s cook Francis used to make. Old Francis was an expert baker and showed us his expertise in the form of biscuits, buns and tarts amidst many other baked delicacies. During one of our holidays my aunt made us children, my sister and our cousins watch Francis make some cute jam tarts. At that time I was more interested in eating rather than making them. I wanted to make the jam tarts that Francis used to make but unfortunately my aunt misplaced her recipe notebook during one of her shifting sprees. There was no way I could replicate those until I happened to see this recipe scribbled behind my biscuit mould. I only had to replace the egg yolk. 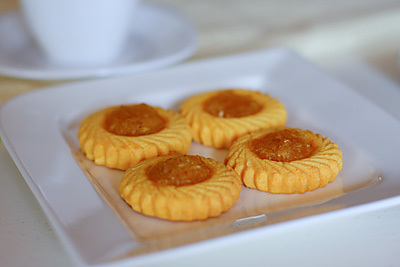 These biscuits are very reminiscent of childhood for me and they would be great in kids snack boxes, sophisticated tea parties or any time one wants to munch into a biscuit with the goodness of jam. Also, a great way to use homemade jam. I have used pineapple jam here, but you can substitute any jam, say strawberry, blueberry or mixed fruit jam. Substitute the butter with vegetable margarine or vegan butter for a vegan version of the cookies. In a bowl, cream butter, icing sugar and vanilla extract until light and fluffy. You can use a hand blender or hand beater to cream the butter and the sugar. Add in the plain flour, custard flour and corn flour and mix well. Stir in the yogurt and form into a smooth, round ball. On a lightly floured surface, roll out the dough to roughly 5 mm thickness. Cut with a jam biscuit or cookie mould. 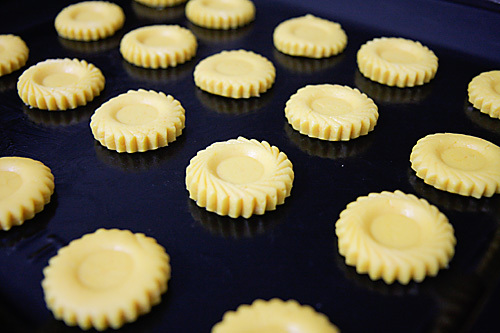 If you do not have one, you can use a round cookie cutter and make an impression with your thumb to fill in the jam. Place the biscuits on a greased baking tray and fill the impressions with the jam. Bake in a preheated oven at 180C /350F/Gas Mark 4 for 15 minutes or till done. 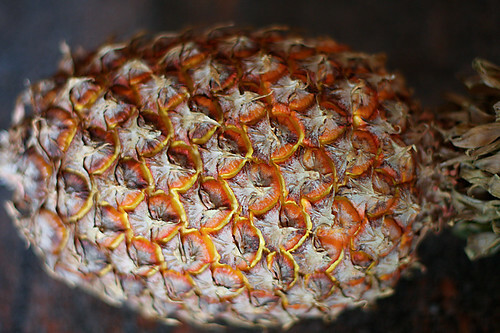 In a heavy bottomed utensil, cook the grated pineapple and sugar until thick and reaches jam consistency, about 15 minutes. Delicious! That Pineapple picture is a masterpiece! Absolutely Genius! These look delicious ! perfect color. what is custard flour ? I love the tart molds. And pineapple jam – amazing! Rustoo: You can say so! If you love jim jams you will love these too. And these are minus the preservatives that come with packaged stuff. RK: Custard powder or flour is available in India. You could substitute any eggfree vanilla pudding powder or cornflour/cornstarch with extra vanilla. oh yes – we really like these type of biscuits, however i have not quite used pineapple jam for them. look great! Luv britannia jim jam biscuits and this one looks really tempting as its with pineapple jam flavour! So pretty. Love the pineapple jam. These are lovely and so elegant! I love the shape! Just beautiful and I love the idea of the pineapple jam! Since you seem to create eggless versions wonderfully. Can you please suggest the best replacement for eggs in cake. If you have a wonderful cake recipe that calls for 2 eggs what will be you first choice of substitute. Once tried baking powder and I was able to taste it , did not like the cake at all. Thanks you so much for your wonderful recipes. Swarna:I have a few eggless cake recipes on divinetaste. Take a look. The eggless vanilla cake and eggless chocolate cake have never failed me. Yogurt in cakes is very good, makes them soft and moist. Try using 1/4 cup plain yogurt for 1 egg and 1 tsp baking powder for another egg (apart from the additional baking powder in the recipe). I dont really use tofu but love to use both buttermilk and flax, depending on the recipe. Hope this helps. Thanks a lot Anu. Will try your suggestion and and let you know how it turns out. I've been getting requests for eggless recipes – is it alright if I post a link to your space? Let me know. Thanks! These biscuits look amazing! You have an amazing mould/cutter in your arsenal!! And I'm sure they taste amazing too! Beautiful layout! I love your pictures. Absolutely droolworthy biscuits! Sure going to try this one. This looks like a very interesting recipe and I must make a note to try it. Your cookies (oops–I mean jam biscuits!) are beautiful, and so is your wonderful blog! I look forward to visiting again soon. Browsing thru your website…….discovered these beauties. I bake a lot too & I love jam cookies. Never came across a tart pan like this ……though I live in the US & always keep looking for some different moulds &bake pans. Can U please let me know what specifically this tart pan is called. I found only the regular ones here. Love your website & will be trying a lot of your recipes. Thanks for sharing. Alpana: I got these on a trip to Singapore. These are available in baking stores in Singapore & Malaysia. Ashwini: Thanks! Good luck…I'm sure you'll do a great job…if you have any doubts let me know. Look forward to your feedback. first time to your blog ,really impressed and addicted ,want to make this cookie and melting moment but have two doubts, hope you will give answer to my queries- i have convention OTG ,on which rack of the oven should it be baked and should both the element of the oven switch on while baking or only bottom element should be on while baking? awesome job! its hard to find such delicacies in vegetarian form,i love baking and i am always in search of egg less bakes,i just got my self new tart moulds n was in search of new dishes,n i found your blog. nywaz i wanted to ask weather can v use ghee instead of butter. as in i have tried with simple version of cookies n they turned out gud enuf.what difference can it make using either of the ingredients??? you are doing a grt job,love ur blog, carryyy on!!! devyani: Yes you can use ghee instead of butter here. 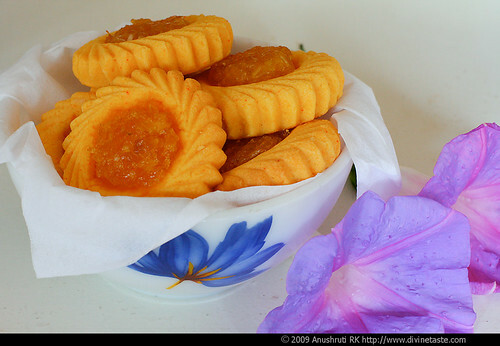 Hi Anu – This recipe is wonderful….I tried it out with margarine and mixed fruit jam…The only thing is that I couldn't fine that mould that gives such lovely biscuits…where can i buy them? any idea? Am based in Mumbai. Anandi: I picked them up in Singapore. They are very popular in South East Asian countries like Malaysia and Singapore. I am missing 1 ingredient in every recipe I have looked into today-but my itch for baking something is persistent…..these look like the perfect thing. Haha-just realized I'm missing pineapple but I do have a mixed berry preserve I would love to use up. They are delicious-made the first batch a little thing, so they felt a bit dry but second batch was perfect! suddenly my wife remembered the JimJam biscuits she used to love some 50 Years back… Rushed to the store only to find Britania treat, in which the jam was so very little… So, next step was Google uncle, and got your site. Thank you very much for the recipe …. The JimJams turned out very well. Thanks a lot. Bharat Bhagat: Thank you so much for the feedback! These look tempting. Can you replace the custard powder with additional plain flour or whole wheat flour. Tia. No..the custard powder gives these biscuits their unique taste and lightness. Plain flour or wholewheat flour will make it heavier. You could try it if you are not particular about the texture. If custard powder is unavailable try using cornflour or corn starch and a tsp of vanilla extract. Can I use thickened cream instead of yogurt? shilpa: Yogurt has a bit of tang and acts as an egg replacer in this recipe. It is better if you use yogurt here. I have a berry mixed jam with strawberries in it. Moreover i have vanilla, strawberry as well as raspberry custard powders with me. Can you suggest which flavour goes well with the jam? Moreover is it ok to experiment with flavours other than vanilla in this recipe? Thanks a lot for teaching us how to cook better! Tarandeep- Thank you for your kind words. Strawberry and vanilla is a winning combination. And ofcourse you can experiment with all the flavours you have to make your own combination. Can the dough be used with a cookie press?